Dogs have proven they can do some amazing things. Although selective breeding programs have been practiced for hundreds, even thousands of years, and were for the sole purpose of developing desired traits in our canine companions, only in the last two centuries has there been such a massive development and recognition of breed-specific qualities and attributes. Organizations like the American Kennel Club and the United Kennel Club recognize specific standards for dog breeds and group dogs according to their heritage of purpose. Some groups are considered herders, others earth dogs and some are in the sporting class, to name a few groups. Each group produces Champions at Internationally recognized dog shows, and the performance sporting group are some of the most fun to watch. But who says you need a best in show breed to enjoy the performance sports? Here are the five performance sports you can practice with your agile pup at home in the yard or out at the dog park. Many dog parks even have built in performance obstacles to challenge you and your dog. Obedience – Is obedience really a performance sport? You’d better believe it is. Every dog that can jump high, balance on catwalks, use seesaws, and move through tunnels needs the learn the art of patience and timing, so he knows when to act; on your command. Rally – Rally is excellent fun for your dog and will challenge his mind and body. Each station you set up will have a particular task associated with it. Your dog has to follow your command and perform each task to make it a rally exercise. 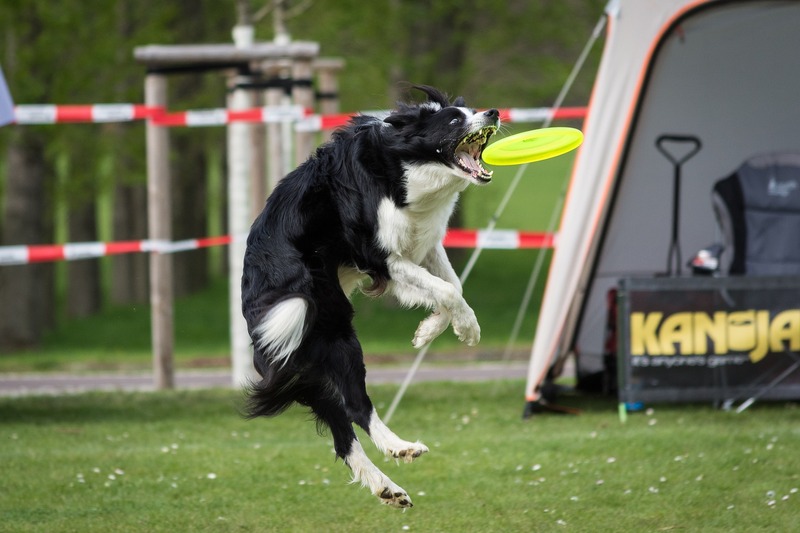 Agility – Ready to test your dog’s balance and technical maneuvers? Agility is the next step in the performance group. Many dog parks and training grounds have agility obstacles, but you may want to work with a trainer at first before jumping in just to practice safety. If you don’t have any access to an agility park, you can always use hula-hoops, buy canvas tunnels, or handcraft some obstacles. But again, always exercise safety and caution. You don’t want to hurt yourself or your dog while trying to have fun. Coursing – If your dog loves to run and chase things, coursing may be an excellent way to engage her mind and body. You can set up a course with a few flags or cones and practice running her through the obstacles. A lure or lead is good ways to get started, and once she’s got it down, the key is speed. In dog shows, this activity is usually reserved for the sighthounds who must rely on their eyes to chase their quarry, but in the real world, any dog that loves to run and loves a challenge will enjoy this activity. Tracking – Tracking is one of the oldest sports for dogs, who have an acute sense of smell. Training and testing their ability to track a scent is age-old, and though mostly practiced by hounds you can have fun testing your dog’s ability to chase down its quarry. Dog’s love to train. It’s mentally stimulating and great for their physical health as well. Find a performance sport you and your dog can enjoy together and get going. All breeds from mutts to pedigrees can enjoy these activities.